Have you ever used a deep kneading heated shiatsu massage pillow for fatigue muscle relaxation. Getting a deep heated massage to your neck, upper and lower back to relieve muscle tension and improve blood circulation is something enjoyable. Heat therapy is a great way to release tension in your tight muscles and improve your blood circulation. If you have difficulty sleeping at night, getting a deep soothing massage with these vibrating heated massage pillows might be just the answer for you. 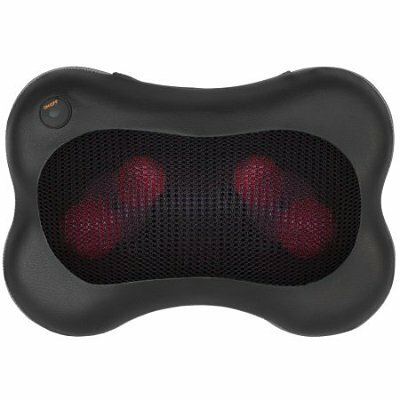 Heated shiatsu neck massagers are portable and can be used on your neck, shoulders, back, thighs and feet. Receiving such a gift is indeed awesome. You get healthy pleasure out of it. A deep massage rejuvenates you – it’s so simple to use yet so effective. Using it after a hard day’s work can be so invigorating. These electric heated pillows act as a body pain relief massager with heat. If you sit for 8 hours at your office job every day, then you’ll really appreciate the deep kneading massage on your stiff shoulder and neck muscles. Check out these 5 deep kneading shiatsu massage pillows with heat as housewarming gifts. This heated Naturalico Shiatsu Massager pillow comes with 4 deep kneading massage nodes that do wonders to your tired muscles. On top of that, the shiatsu massage machine comes with heat function that improves blood circulation and brings relief to aching muscles. Designed with an ultra slim body (13.5″ L x 9″ W x 3″ H), it is perfect for use on lower and upper back, neck, abdomen, calf as well as thigh areas. An adjustable strap makes it easy to strap it to your chair or car seat. With control buttons located on one of the straps, it is easy to change direction of the massage nodes. Another great attractive feature is the ability of this heated shiatsu massage pillow to auto reverse rotating kneading actions during each massage sessions that last 20 minutes. It comes programmed with safety features such as the Overheat Protection Device and a 20 minutes auto shut-off. The Naturalico heated massager comes with ac adapter as well as car adapter. The only disadvantge would be that the heat temperature cannot be changed. 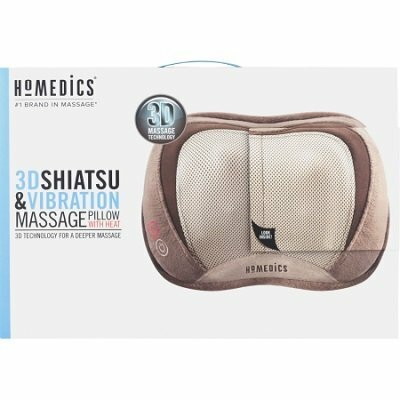 The electric Homedics shiatsu neck shoulder massager pillow makes use of 3D technology delivering circular kneading with inward and outward motion. The heated invigorating vibration soothes and loosens tired and tight muscles around your neck, shoulders and back. The massage pillow comes with both kneading and vibration massage. You can also choose to have only the shiatsu and heat massage without any vibration or massage with vibration but without heat. The machine automatically switches off after 15 minutes so there is no danger of overheating. This full body heated shiatsu massage pillow brings relief to your tired aching muscles whether at the neck, back, abdomen, arms, legs or feet. It comes with 6 massage nodes, 4 for deep kneading and 2 for soft kneading. Auto shut off and overheat protection ensures a safe massage. Besides the auto mode, you can choose for an inward/outward kneading massage or you can choose a massage without heat. And you can control all these functions with the remote control that is provided. This neck, shoulder and back massager with heat comes with a cool 30 adjustable modes and 10 levels of strength ranging from low to high. You do not have to worry about the device getting overheated as it comes with a 15 minute auto shutoff timer. Massage time will last 15 minutes. The remote control that comes with it makes it very convenient to use. This heated shiatsu massage pillow comes with 4 dimensional deep kneading shiatsu massage nodes that automatically massages in opposite directions every minute. The soothing heat function is great for improving blood circulation and relaxing tired muscles. The heating can be turned off if you prefer just the shiatsu deep kneading massage without heat. Its handle straps can be adjusted to allow you to massage in your most comfortable position or you can securely strap it to a chair or the car seat. 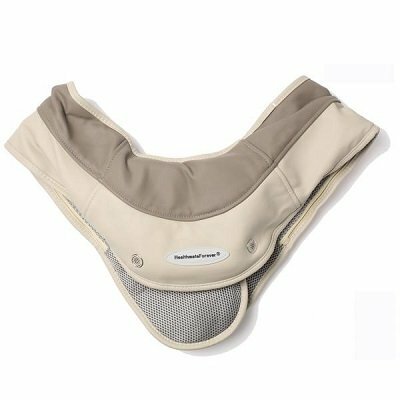 It comes with a U shaped ergonomic design that fits perfectly onto your neck, upper and lower back as well as abdomen, calf and thigh areas. It comes with Overheat Protection and is automatically shut down after 20 minutes. It measures 13.5″ L x 9″ W x 3″ H.
It comes with both the home and car charger cord. You can control the intensity of the massage by how deep you press or lean onto the shiatsu heated massager. Deep kneading shiatsu massage to relieve muscle tension and pain right in the comfort of home is such a wonderful idea. Compact and powerful, giving one of these 5 deep kneading shiatsu massage pillows with heat as housewarming gifts will surely be well received and cherished.